Observation - Wood Tiger Beetle - UK and Ireland. Description: A tricky subject to capture, the Wood Tiger Beetle lives on warm, sandy soils. It has excellent eyesight and is quick to take off and fly from potential danger. The adult and larvae are carnivorous feeding on invertebrates. 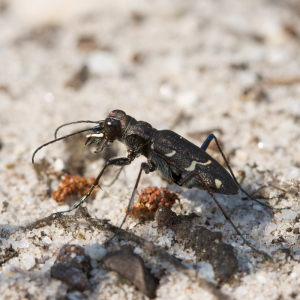 A tricky subject to capture, the Wood Tiger Beetle lives on warm, sandy soils. It has excellent eyesight and is quick to take off and fly from potential danger. The adult and larvae are carnivorous feeding on invertebrates.